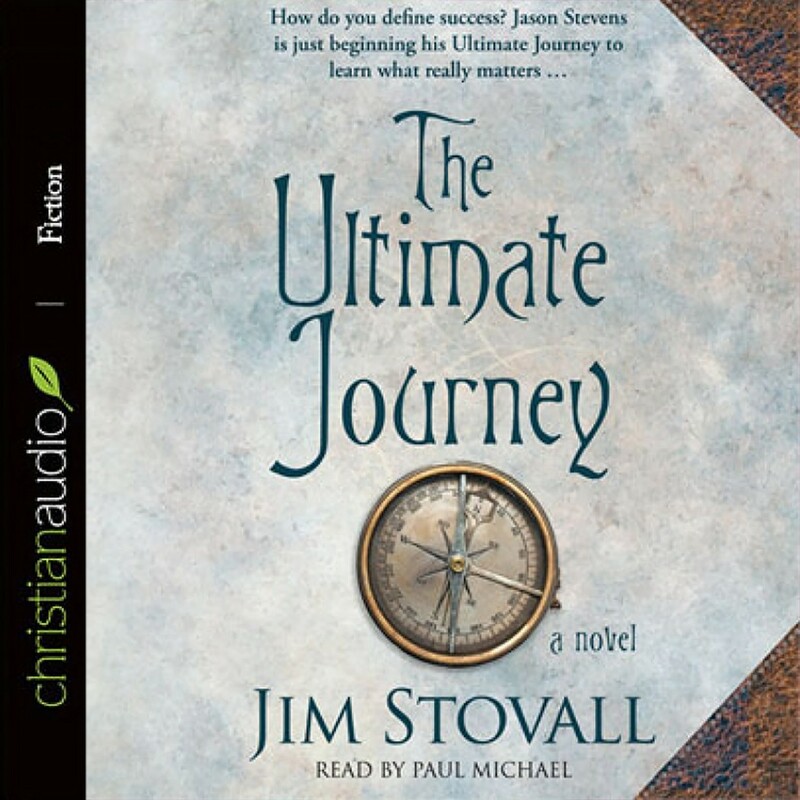 The Ultimate Journey by Jim Stovall Audiobook Download - Christian audiobooks. Try us free. "The Ultimate Journey" Book Three in the Ultimate series written by Jim Stovall has been released in audiobook format by christianaudio and is available from them at christianaudio (http://christianaudio.com) and is narrated by Paul Michael. Jason Stevens has lived through both "The Ultimate Gift" and "The Ultimate Life" and has learned quite a bit about life and the living of it from experience and from video made especially for him by his grandfather, Red Stevens. Now in this last adventure Jason and his new bride, Alexia are given a journal of Red Stevens, Jason's grandfather and their life picks up again. If you read the first two books in this series then you know that there are twelve journeys each of us takes and Red's journal and DVD take the young couple through each of these journeys again. Each chapter has something from Jason, Alexia, Red and Red's Chauffeur and each has something new to teach us about living. As with each of the previous books there are gems in each journey that we should learn to take with us as these books are both fiction and parables combined. It is an injustice to say that Paul Michael is the reader of this book. Paul Michael brings his soothing voice and manages to bring to life what was originally written on pages. Mr. Michael skillfully and artistically weaves different inflections and intonations into each character permitting the reader to stop listening to an audio book and become part of the story itself. Mr. Michael does a magnificent job of creating the emotion of the moment as we travel through what Mr. Stovall had written. I, personally, do not have time to just sit and read all the books that I would like to read so audiobooks make my life much easier. I can take the book with me in the car and play it while I am driving to work or to the store. We need the ability to fill up our commute with good Christian material that will allow us to expand our world and gain new insight into what is going on around us. christianaudio meets that need. Paul Michael narrates Jim Stovall's third installment of the <em>Ultimate Gift </em>series, <em>The Ultimate Journey, </em>with a smooth voice that replicates the essence of Red Stevens, much like the performance James Garner provides in the movie presentation of the first book. Michael guides the reader through the interactions of Jason and his bride, Red on his DVDs, and the chauffeur that served them both. Skillfully and artistically weaving different inflections and intonations that each character carries in their character, Michael permits the reader to stop listening to an audio book and become part of the story itself, allowing images of the scenes to dance before the listener's eyes. One has to admit, however, that despite Michael's talent, his imitation of Alexia, Jason's bride, sounds more like an effamenant man that a female voice. What a delightful audiobook this is. I haven’t come across this Trilogy before, so it really has been a joy discovering Jim Stovall and the Stevens. The writing style translates very well to an audiobook. At times I could see the different characters very clearly, and in particular that diary that is mentioned throughout. There are a great many lessons here or everyone to listen to and take something away to help live your life better. I loved so many chapters and particularly liked the ones about dreams, laughter and the ‘Golden List’. Paul Michael narrates perfectly, doing the different voices so well, that I forgot it was just one person narrating. I think this would be a great gift for newly weds and anyone starting off in a new direction. I’ve been listening to this audio on my mobile phone which has a mp3 player and its sounded really good throughout. Thanks to christianaudio.com.com Reviewers Program for this copy. How do you define success? In The Ultimate Journey, Jim Stovall’s third novel following the life of Jason Stevens, the reader takes a look at this question through the life of Jason’s grandfather, Red. As Jason and his new bride, Alexia, begin their journey together, we are given a glimpse into true success through the eyes of Red’s personal chauffeur and through Red’s diary. This is done using the 12 gifts from Stovall’s first novel, The Ultimate Gift, as the basis. Like The Ultimate Gift, I found this book inspiring. Stovall uses a beautiful and touching story to give a timeless message to the reader about the meaning of life and how to find true success. You will laugh and you will cry. We are reminded on multiple occasions of Alexia’s daughter, Emily, who brought she and Jason together in the first novel. We are also reminded of many moments from the first novel and even given new insight into some of what took place in the same. I have only read the first and third novels in this series, but I am looking forward to reading the second also. I encourage you to read all three as well. You will be touched, you will be inspired, and maybe you will become a better person because of it. The audiobook was read by Paul Michael, who also narrated A Tale of Three Kings. As with the other book, he did an excellent job. I became immersed in the story as I listened because of his reading. The production quality was also very good. Another great release from christianaudio. Disclosure of Material Connection: I received this audiobook free from the christianaudio Reviewers Program. I was not required to write a positive review. The opinions I have expressed are my own. I am disclosing this in accordance with the Federal Trade Commission's 16 CFR, Part 255: "Guides Concerning the Use of Endorsements and Testimonials in Advertising."